For the first time since 2010, Apple gave us the opportunity to watch, what was once an invitation only event, live. I must say, this is a very good approach made by Apple. Millions of people around the world got the opportunity to watch the event live from their computers, laptops, tablets and smartphones. Before revealing the product, Phil Schiller, Apple Marketing Chief boasted how the media praised the 15 inch Macbook Pro with the Retina Display and managed to outgrow in the PC market this year. It has been named the best of the best gaining the No.1 spot as the best notebook in the US. To retain this particular spot for a longer time, the all new 13” Macbook Pro was unveiled. The rumours were indeed 100% correct. It has just been 4 months since the Third Generation Macbook Pro was released in the WWDC event held in San Francisco which came with 3rd generation Core i7 Processors and a very high resolution of 2880 x 1800 pixels, the first ever retina display notebook. By seeing the picture you can easily see that it’s incredibly thin, 20% thinner than the original weighing around 3.57 pounds. That’s around 1.62 kg only. Although its heavier than the Macbook Air, it is the lightest Macbook Pro. Most importantly, as this is the mini version of the 15′ Macbook pro, why would it miss out having the special feature which it’s predecessor has ? Yes, it comes with the outstanding Retina Display. The 13.3 inch Macbook Pro boasts a resolution of 2560 x 1600 with around 4096000 pixels in total offering 232 PPI with IPS Display. 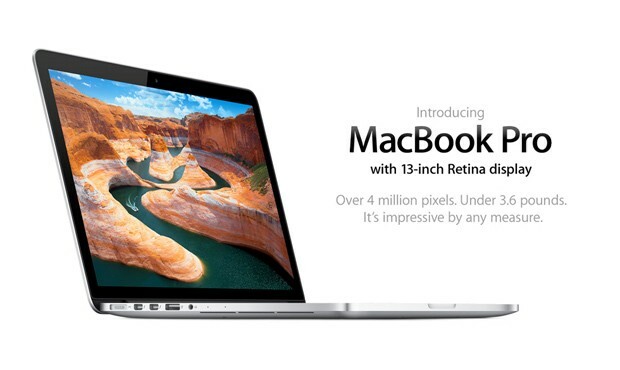 This Macbook is not only the lightest but also has more pixels than any other laptop in the market. The new Macbook Pro also has the power nap feature which enables the Macbook to download and do other tasks while it sleeps. This is one intriguing feature introduced by Apple and a very useful one. Comparing the 13.3 inch with the 15 inch, it’s .04 inches smaller in height, 1.11 inches smaller in depth and 1.75 inches smaller in width. Apart from measurements, the Macbook Pro comes with Intel HD Graphics 4000 with the provision of dual display and mirroring. Just as its predecessor, it has a 720 P FaceTime HD Camera, Bluetooth 4.0, 802.11n Wi-Fi wireless networking, MagSafe 2 power port, HDMI, Headphone, 2 USB 3.0 ports, 2 Thunderbolt Ports and a SDXC Card slot. It has about 7 hours of Batter Power with wireless web browsing and upto 30 days of standby time. The 2.5 GHz, Dual Core Intel Core i5 processor with 128 GB in storage costs around $1699, as expected, whereas with the 256GB it costs around $1999 . This is one good upgrade and Apple has made a smart move by unveiling this product which will keep themselves at the top. On the other hand, they know that the competition will get even more fiercer in the coming days. We have to wait and watch for two events, Google’s and Microsoft’s at the same day, to see how they respond.